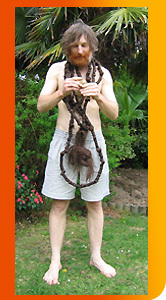 This is the story behind my part in the Guinness World Record™ for the Longest hair extension. This record was a shared one, involving attaching 6.69m of hair extensions to my head - that is almost 4 times my height, and they weighed close to 3kg! Now I am sure you have all seen hair extensions such as the products sold by Hothair , which are readily available worldwide and can be fitted easily.However, for record-breaking hair extensions, you need to see a specialist. I was fortunate to have a Zambian lady – from Garden of Eve – work on my new hair-do statement. African women are renowned for their skill at hair braiding and alterations. Evelyn was no exception; in fact, she was world class! I sat in the same position for half a day in one of New Zealand's biggest shopping malls as my scalp was picked at, brushed, and my naturally short hair pulled incessantly. As the rules stated, she worked single-handedly, and with meticulous attention to detail. Some passers-by gave us strange looks but many could see the humour, and we loved the attention from them all. It was definitely worth the experience. When I stood and turned to see for myself, I was genuinely impressed with what Evelyn had done for my looks. No longer was I that regular face I've been seeing for 35 years; now I was a hair parading star. And now the antics really started! To complete the world record attempt, all I'd have to do was a few days of administration. But I chose to challenge myself on how long I could wear this hair. Once I took it off, I'd not be able to reattach it. Worried that I might get my locks wrapped around a vehicle wheel axle when walking along busy inner city streets, and hence end my life twirled around a spinning mechanical shaft, into a school satchel went the hair, tied together like some bizarrely twisted snake. The satchel became an extension of my body for the next 51 days. Not all went smoothly. I sweated heavily in the New Zealand summer heat, and could sometimes smell an unpleasant whiff rising from the back of my head – dried sweat collecting dirt, no doubt. When showering, I was repeatedly given a rude reminder that I was effectively tied to the satchel, hanging off a metal coat hanger on the railing, each time I tried to pick up the soap. And I recall almost suffocating and awaking in panic very early one morning. But, best of all, were the stares I'd get in public. The most memorable was when I was waiting for a pedestrian traffic light to turn green. A driver caught my eye, or rather, my hair captured his undivided attention. He stared as if hypnotised. When the light changed, he gradually accelerated while turning through traffic without even flinching. As I gestured for him to watch his driving, he remained transfixed on the hair extensions, slung over my shoulder that day like a cowboy lasso for a change. How he didn't drive himself into a vehicle accident, I don't know. "Hey, why are you staring - it's only a world record", I thought. I stuffed the coils I was becoming so fond of back in their smelly satchel, hoping to avoid a more serious incident next time. Then, sadly, the New Zealand Police got involved. When day number 51 came, Evelyn carefully cut my head free from the artificial adornments. I washed them for the first time and hung the twisted snake-like coils out to dry on my verandah. Several days later, I had a reason to lodge a case with the authorities, which I lamented over by writing the poem below. These verses have since been aired around Australasia. has left me feeling deep in despair. and made a rope out of my new hair. But now, all twenty-two feet's not th-hair. Yes, I've looked all around hair. even under my favourite armch-hair. now that somebody's stolen my hair. maybe someone will find my brown hair. is it in a drain in disrep-hair? For sale, or new to someone's car-hair? I'd love it back, my world record hair. Alastair Galpin – World record-breaking, Storytelling, Photo licensing. © Alastair Galpin. No photos on this website may be used without prior written consent.